Industrial look of the spring spout for a gourmet kitchen. Matte black is gaining popularity because it adds a focal point to your kitchen. The modern pull-down faucet offers a high clearance below the spout for filling and cleaning large pots. High-arc spout swivels 3600 to offer complete sink access. Delta ShieldSpray Technology cleans with laser-like precision while containing mess and splatter. A concentrated jet powers away stubborn messes while an innovative shield of water contains splatter and clears off the mess, so you can spend less time soaking, scrubbing and shirt swapping. Delta MagnaTite Docking uses a powerful integrated magnet to pull your faucet spray wand precisely into place and hold it there so it stays docked when not in use. Delta SpotShield Technology helps to keep your faucet cleaner, longer by resisting water spots and fingerprints. Delta faucets with Diamond Seal Technology perform like new for life with a patented design which reduces leak points, is less hassle to install and lasts twice as long as the industry standard. With a unique combination of sleek curves and geometric angles, the Rubicon faucet brings a fresh, clean look to the kitchen. A sturdy, simple design makes this faucet easy to operate and easy to clean. The pull-down sprayhead switches between stream and Sweep spray. This faucet includes a soap/lotion dispenser. Inspired by restaurant kitchens, the Sous faucet brings the convenience and performance of a professional faucet to your home kitchen. A high-arch spout with exposed spring provides outstanding range, flexibility and control for every task, from food prep to filling pots to cleanup. Switch from stream to powerful Sweep® spray with a quick touch of the sprayhead button. This faucet includes a soap/lotion dispenser. Sleek, graceful curves and unique facets give the Trielle faucet its organic character and a fresh, contemporary style. The two-function sprayhead lets you switch between stream and Sweep® spray, a wide, forceful blade of water for superior cleaning. The DockNetik® docking system secures the pull-down sprayhead to the spout using magnetic force. A matching soap/lotion dispenser is included. 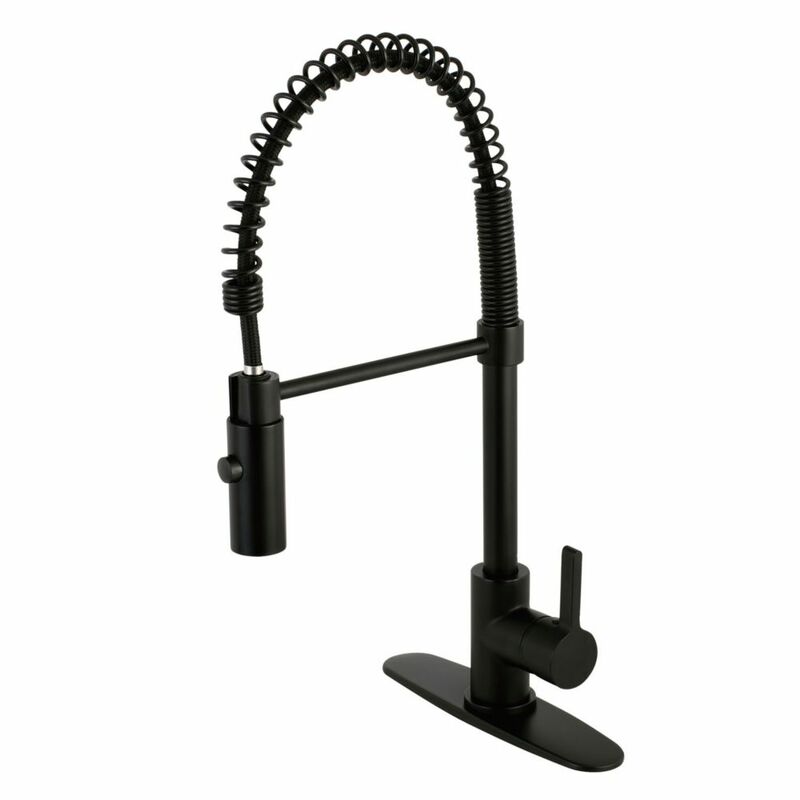 Contemporary Single-Handle Pull-Down Sprayer Kitchen Faucet in Matte Black Industrial look of the spring spout for a gourmet kitchen. Matte black is gaining popularity because it adds a focal point to your kitchen. The modern pull-down faucet offers a high clearance below the spout for filling and cleaning large pots. High-arc spout swivels 3600 to offer complete sink access. Contemporary Single-Handle Pull-Down Sprayer Kitchen Faucet in Matte Black is rated 3.6 out of 5 by 7. Rated 2 out of 5 by Nadia from The faucet looks great, the challenge was the installation. The... The faucet looks great, the challenge was the installation. The parts that were provided were not of quality and water was continuously leaking, no matter how much we tightened them. We ended up having to purchase plumbers tape and other tools to get the pipes to stop leaking under the sink. Rated 1 out of 5 by Kimberly from Beautiful faucet.....terrible quality. I have had this faucet installed for... Beautiful faucet.....terrible quality. I have had this faucet installed for one month. I love the way it looks but the paint is already chipping off. I would not recommend purchasing this product. I have not used any abrasive cleaners on it and have followed the care instructions. Rated 5 out of 5 by Pooh from This faucet is absolutely gorgeous in person. We are very pleased with it. Two things to note. ... This faucet is absolutely gorgeous in person. We are very pleased with it. Two things to note. We had never seen a faucet that had two female connectors coming off of it. We had to buy an adaptor in order to hook up one of them to our service line, to change it to a male because the 3/8" connection was not available in a male. Also, the faucet is very tall. We love it but take that into consideration for your space.